The Commission is carrying out an electoral review of Cornwall Council. The aim of the electoral review is to recommend division boundaries that mean each councillor represents approximately the same number of voters. We also aim to ensure that the division boundaries reflect the interests and identities of local communities, as well as promoting effective local government. To achieve these aims, we need to re-draw division boundaries across Cornwall. You can find out more about the review below. On 4 December, we published final recommendations for future electoral arrangements in Cornwall Council. We have now completed our electoral review of Cornwall. Final recommendations map for Cornwall Council - please note: this map is very large and may take some time to download. The draft Order will provide for the new electoral arrangements for Cornwall Council to come into effect at the local elections in 2021. The consultation on the Commission’s draft recommendations for Cornwall Council closed on 17 September 2018. On 5 June 2018, we published our draft recommendations for the electoral review of Cornwall Council. From 5 June 2018 to 17 September 2018 , we are accepting opinions and comments (submissions) from the public on these recommendations for Cornwall Council. Draft recommendations map for Cornwall Council - please note: this map is very large and may take some time to download. An interactive map of the draft recommendations, visit our consultation area. You can view both the existing and proposed boundaries, search by area or postcode, and have your say. A non-interactive image of the proposed division boundaries is also available. The consultation on division arrangements for Cornwall Council closed on 19 February 2018. The consultation on division arrangements for Cornwall Council has now closed. On 26 September 2017, we started the first period of consultation for a new pattern of divisions for Cornwall Council. Between 26 September 2017 and 19 February 2018, we invited comments on the division boundaries for the authority. The Commission also announced that it was minded to recommend that Cornwall Council should have 87 councillors in the future. Commission Meeting Report on Cornwall's Council Size. You can view the polling district map below. Please note, polling district mapping data has been supplied by Cornwall Council and may contain boundary errors. To view the existing division arrangements, visit our consultation area. You can search by area or postcode. Alternatively, a non-interactive image of the current division boundaries is also available. The consultation on the number of councillors for Cornwall Council closed on the 7 August 2017. The first stage of this electoral review was to determine the number of councillors who should represent the local authority in the future. We call this stage 'council size'. During this preliminary stage of the review, the Commission received 4 proposals from Cornwall Council. The Commission considered these submissions and sought views on its proposal for a council size of 87 members for Cornwall Council. A letter sent to the Chief Executive (PDF), our consultation document (PDF) and our news release provided more details on this consultation and the review in general. We will consider the number, names and boundaries of wards during two further periods of public consultation later in 2017 and 2018. The Boundary Committee for England (BCFE) began reviewing the electoral arrangements of Cornwall County Council on 11 March 2003. The Order implementing The Electoral Commission's decision on the final recommendations of this review has been made and can be viewed on Her Majesty's Stationery Office's website. The Order refers to a map comprising Sheet 1, Sheet 2, Sheet 3 and Sheet 4. The Implementation Team section of The Electoral Commission's website explains how The Boundary Committee for England's final recommendations are made into Orders. Mapping sheet 1 , illustrates in outline form, the proposed divisions for Cornwall County Council, including constituent district wards and parishes. Mapping sheet 2 illustrates the proposed electoral divisions of Meneage & South Helstone and Porthleven divisions in Kerrier district. Mapping sheet 3 illustrates the proposed electoral divisions of Newquay Central, Newquay North, Newquay West and St Enoder & Colan divisions in Restormel borough. Draft recommendations, published on 24 February 2004. Sheet 1 illustrates in outline form the proposed divisions for Cornwall. Sheet 2 illustrates the proposed divisions in (a) North Cornwall district and (b) Kerrier district. Sheet 3 illustrates the proposed divisions in Restormel borough. Links to submissions are currently unavailable on this page. Please bear with us as we work to restore the page. 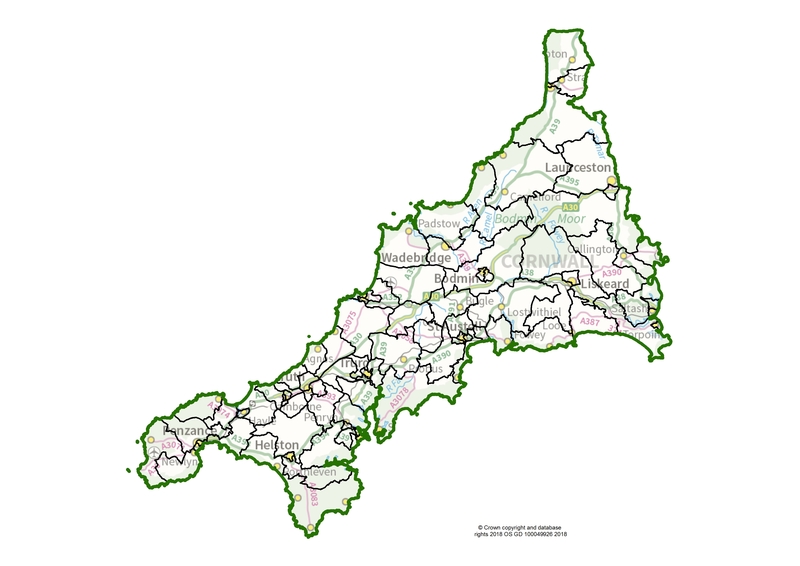 The Cornwall (Electoral Changes) Order 2011, to implement recommendations made by the Local Government Boundary Commission for England (LGBCE) for new boundaries in Cornwall, was made on 4 January 2011 and published on 7 January 2011. 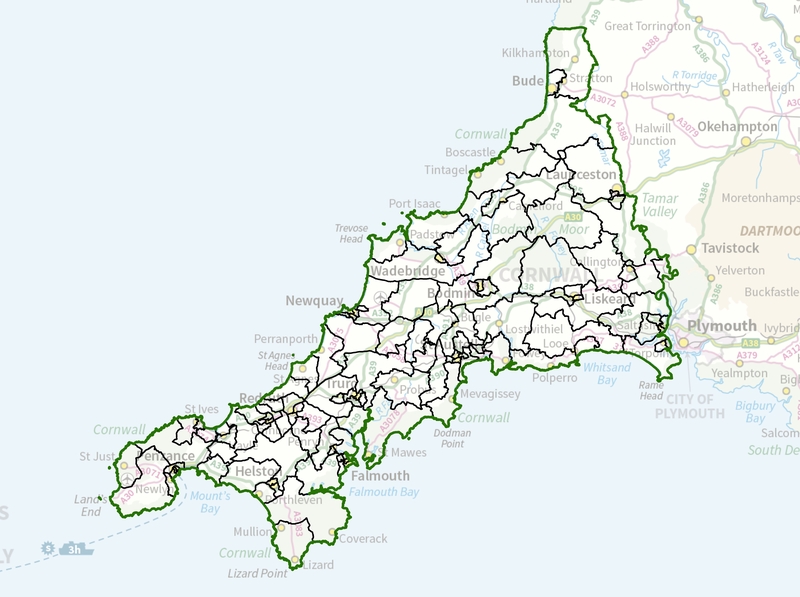 New electoral divisions for Cornwall have now successfully completed a 40 day period of Parliamentary scrutiny and will come into force at the local elections in May 2013. The made order refers to the same map as the draft order. On 11 October 2010 the Cornwall (Electoral Changes) Order 2011 was laid in draft in Parliament. The draft order if made would give effect to the final recommendations that were consulted on during the Boundary Committee for England’s review of electoral arrangements in Cornwall and published on 8 December 2009. The draft order will be laid in Parliament for a period of 40 sitting days. Parliament can either accept or reject our recommendations. If accepted, the new electoral arrangements will come into force at the next scheduled elections for Cornwall in 2013. Please note: some of these sheets may be very large and may take some time to download. On 8 December 2009 we published final recommendations for future electoral arrangements in Cornwall. These are available through the links below. Final recommendations (PDF) and summary of the report (PDF). We also issued a press release (PDF). We have now completed our electoral review of Cornwall. The changes we have proposed must be approved by Parliament. An Order - the legal document which brings into force our recommendations - will be laid in Parliament. Parliament can either accept or reject our recommendations. If accepted, the new electoral arrangements will come into force at the next elections for Cornwall Council in 2013. On 2 December 2008 we published draft recommendations (PDF) for new electoral arrangements in Cornwall. We also published a summary of the report (PDF). Please note: some of these maps may be very large and may take some time to download. Map 1 is an overview of the county and includes key boxes that show the specific areas of the county to which the detailed maps (2-20) refer. On 9 September Implementation Executive submitted revised figures for its 123 member scheme. These figures contain minor modifications to reflect the most up to date information and correct small errors in the original figures. The modified figures supersede those submitted in its original 123 member scheme. On 21 May 2008, we sent a letter to Councillor David Whalley (PDF), chair of the Cornwall Implementation Executive, outlining the Committee's position at the time. On 26 February 2008, we started an electoral review of Cornwall. During the first stage of the review (to 21 April 2008) we have invited proposals for the future electoral arrangements for Cornwall. Below are the submissions we received at Stage One. Having recieved submissions during Stage One, we wrote to some proponents to ask for further evidence relating to proposals for council size. The letters sent and questions asked can be found below.